Summary (from Goodreads): Mara Dyer doesn't think life can get any stranger than waking up in a hospital with no memory of how she got there. My Thoughts: This was a really entertaining, quick read for me. The main character, Mara, is as normal as it gets until the accident rips her life apart, and the way the author portrayed Post Traumatic Stress Disorder made it seem really believable. The dialogue in the novel was really well done - I can vouch for teens everywhere when I say it was pretty close to the way we usually speak (unlike some novels, which totally, like, make it seem like everyone, like, says like a bunch of times...). The writing was really good, but there were a few cliche YA paranormal elements that took away from the story. I think this is one of those novels (like Hush, Hush) that you people either love or hate; it wasn't my personal favourite, but it was pretty entertaining. I'll probably be purchasing the sequel. 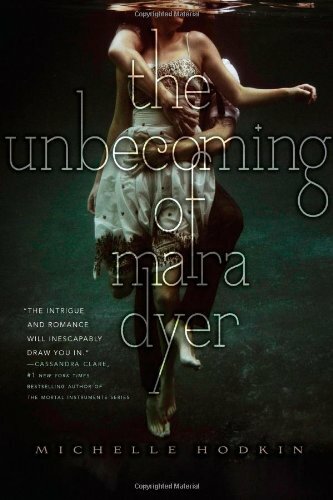 Final Thoughts: I recommend this novel to anyone who enjoys YA paranormal romance and is looking to read something that's not about werewolves or vampires. I can't say I'd recommend it to teens under 16, but older teens will enjoy it.